Dhaka: Bangladesh's imprisoned opposition leader Khaleda Zia was handed another seven years in prison on Monday on corruption charges her supporters say are politically motivated to prevent her running in a general election. Zia, arch-rival of Prime Minister Sheikh Hasina, is already serving a five-year term imposed in February on separate embezzlement charges. A small demonstration was held outside Zia's Bangladesh Nationalist Party (BNP) headquarters in Dhaka after the sentencing. The opposition has vowed nationwide marches on Tuesday. The February verdict triggered clashes between police and thousands of BNP loyalists. In the latest case, Judge Mohammad Akhtaruzzman found the 73-year-old guilty of abuse of power and embezzling 31.5 million taka ($375,000; Dh1.3 million) meant for a charity. The verdict was handed down in a temporary court inside Dhaka Central Jail where Zia is the only inmate. Her health has deteriorated in recent months and her lawyers say she needs specialist care, which has been refused by the government. The lawyers, who boycotted the verdict, have slammed the fast-track trial as "political vengeance" by Hasina, who has been accused of stifling opponents. "The people will never accept this judgement," BNP secretary general Fakhrul Islam Alamgir told reporters. Zia cannot stand in the election due at the end of the year while serving a jail term and time is now running out for appeals to be heard to let her run. 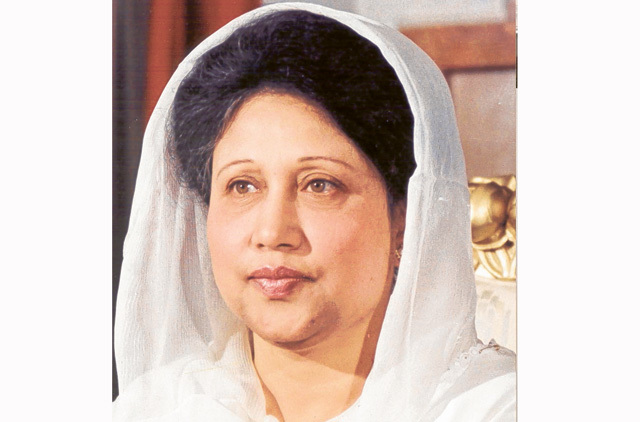 Zia boycotted the 2014 general election which Hasina won. And the latest verdict throws up more hurdles for the opposition, which says 4,000 of its supporters have been arrested since September in a pre-election crackdown. But the ruling party has agreed to hold talks on the looming election with an opposition alliance that includes the BNP, a minister announced hours after the verdict was announced. The ruling Awami League had previously rejected such talks. The Jaitya Okya Front (United Nationa Front) has demanded that the election be held under an interim neutral government. But Awami League deputy chief and influential minister, Obaidul Qader, said his side had agreed to talks "without giving in to anyone's pressure". No date has been given for the talks however. And Zia's supporters are certain that the multiple legal cases against her and her family are intended to keep her out of the election. Zia, widow of assassinated military dictator Ziaur Rahman, faces dozens of separate charges related to violence and corruption that her lawyers insist are baseless. Her son and heir-apparent Tarique Rahman was jailed for life in absentia this month over a 2004 grenade attack on a Hasina political rally. Rahman lives in exile in London. Prosecutor Khurshid A. Khan said the latest charges against Zia dated back to 2005 when she was serving her second term as prime minister of the Muslim-majority nation of 160 million. "We finally got justice, despite some delay," he told AFP. The new guilty verdict comes at a time when the independence of Bangladesh's judiciary is under question. In a recent memoir, a former chief justice alleged he was forced into exile last year after disagreeing with Bangladesh's powerful intelligence services over a case. Another judge, who now lives in Malaysia, alleged in a television interview that he was threatened to order a guilty verdict against Rahman.